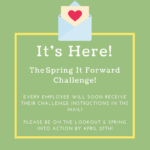 In March 2018 we launched a Spring it Forward Challenge. 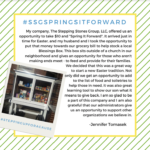 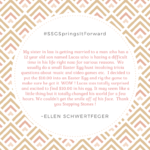 Stepping Stones would like to be intentional about serving our communities, so we sent a letter to all employees at SSG that included instructions on our SPRING IT FORWARD initiative. 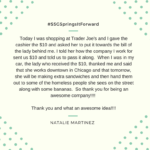 This was simple, but powerful. 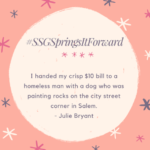 Each letter included a $10 bill asking them to SPRING IT FORWARD. 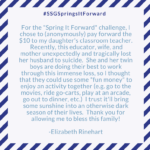 The possibilities for SPRING IT FORWARD are endless. 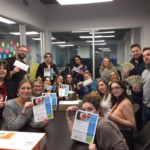 We involved our family and friends and together, made a positive impact!